Hello, and welcome to my website. 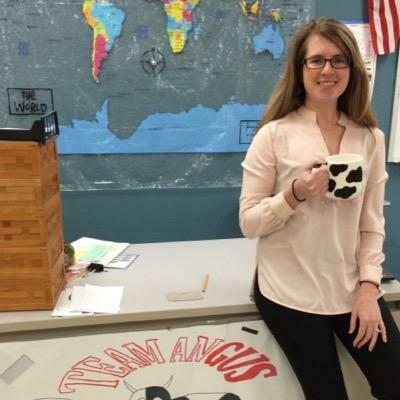 My name is Ms. Meller-Angus and I teach at Northview middle school in Ankeny, Iowa. I teach 9th grade Global Studies and 8th grade American history. I previously taught at Clear Creek Amana for the past eight years and at Coe College College for Kids for the past five summers. I graduated from the University of Iowa in 2006 with a BA in History, Psychology, and certification in American Sign Language. I later become Project Lead the Way, Gate Way to Technology, certified in 2007 at the University of South Carolina. In 2009, I received my Masters in Educational Technology from the University of Missouri. During my time teaching I have taught a little of everything, Iowa History, Modern American History, 8th grade social studies (American History 1492 - 1765), Psychology, Eastern Cultures, Western Cultures, Technology, Project Lead the Way, and American Sign Language. I'm very passionate about traveling and it has shaped me as a person and how I teach. I spent some time student teaching in Bath, England and back-packing around Europe. In addition, I have attended different teaching seminars in Korea and Japan. I believe it's very important in today's society for students to be connected to the world. If you have any questions please contact me during my office hours from 7:45 to 3:45 by calling me at (515) 965-9700 or emailing me at Kimberly.mellerangus@ankenyschools.org. To reach me, click on the icon below.